Hopefully after reading this and following blog posts (yes, there will be more!) you will be able to see if mqtt-spy is for you or you would be better off with one of the great alternatives out there. The project was started in early 2014 with the aim of simplifying development and test activities for MQTT-based systems. Particularly those that generate at least a few hundred messages per second and use custom message envelopes with either encoded, signed and/or encrypted payloads. The first design goal was to make it useful for debugging and fault investigation - to sieve through hundreds or thousands of messages arriving each second that spread across tens or hundreds of topics - and still being able to find the ones of interest. The second design goal was to make mqtt-spy as much user-friendly as possible while retaining its advanced capabilities. To help you with finding your way around it there is an extensive wiki available on the project’ home page. mqtt-spy is made available for download as an executable Jar file. This means it requires an appropriate version of the Java Runtime Environment to be installed on your operating system. Once downloaded, just double click on the Jar file and mqtt-spy should start. It is also possible to start mqtt-spy through the command line, run it with a specific version of Java (not just the default) or run it with additional libraries - see Getting Started for more details. 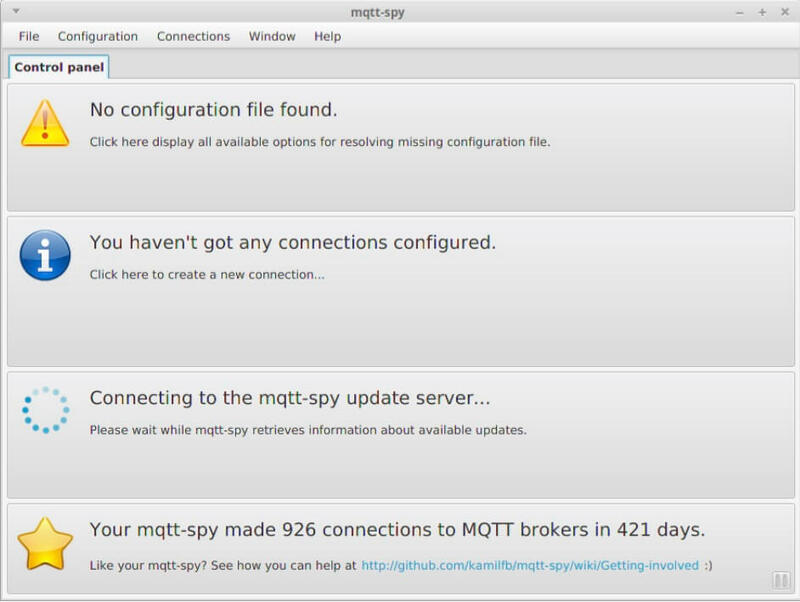 Every time you open mqtt-spy you are going to see the control panel (see below). It gives you a quick summary of the configuration that’s been loaded (first two sections), the update status (checked at start-up) and some basic statistics about usage. 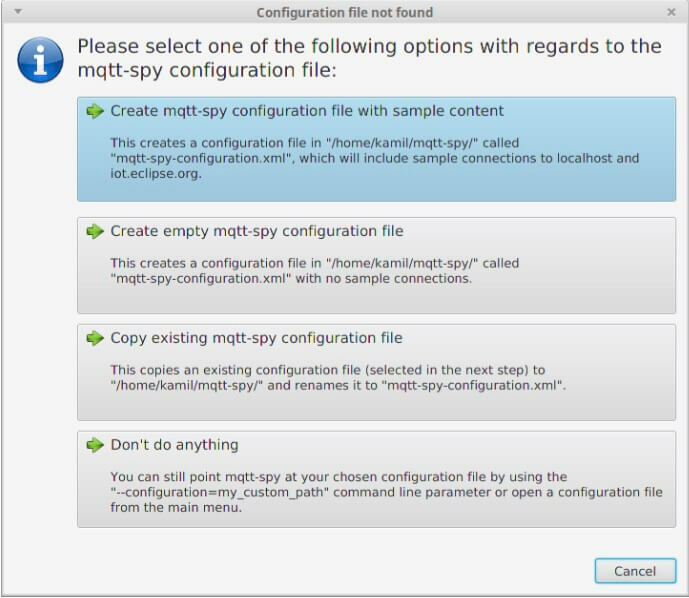 ￼When using mqtt-spy for the first time, it is recommended you create a configuration file with sample content – this will give you a list of public MQTT brokers/servers to which you can just connect and start experimenting with. You can also re-create the configuration file at any point from the “Configuration” menu. For new connections or to charge configuration of the existing ones go to the “Connections” menu. Once opened, a new connection tab will appear. The connection tab’s tooltip gives additional information about your connection (where applicable): connection status, last update, number of connection attempts, last error, authentication status, TLS/SSL status. The last important aspect of the connection tab is its context menu, giving you access to broker’s statistics and various UI settings. OK - now let’s take a look at subscriptions and how to receive messages. To create a subscription, put the subscription topic (can include wildcards like + or #) into the Topic field and either hit Enter or click the Subscribe button. This should create a new subscription tab, in which you will see all received messages matching this subscription. Again, the subscription tab has got a context menu, which gives you access to some of the key features like charts. To select the QoS for the subscription, make sure you change to a detailed perspective (Menu -> Window -> Change Perspective). With a subscription now in place, we can try publishing a message. Put your publication topic and the payload you want to send, and click the Publish button. This should result in a message being published, and if it matches your defined subscription, you should see a message in the subscription tab. To select the QoS for the publication, make sure you change to a detailed perspective (Menu -> Window -> Change Perspective). 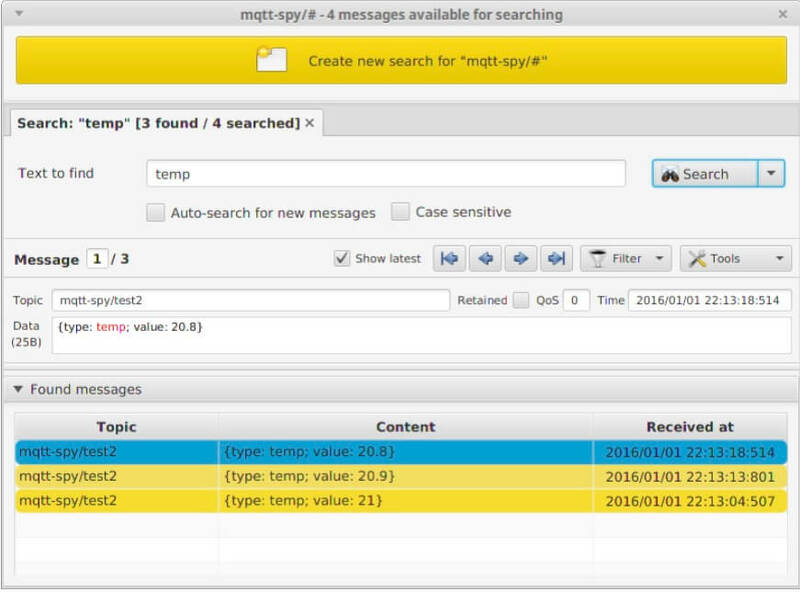 mqtt-spy takes a different approach to message browsing. Rather than displaying the received messages as a graphical list, only one message is shown at a time. By default, the latest/newest message is shown – this gives you an insight into what’s going on on the browsed topic(s). You can disable showing the latest by deselecting the “Show latest” checkbox. You can navigate to the message you want to see in a number of ways. You can either use the navigation buttons, mouse scroll when over the message index field or the navigation keys (up/down arrows, page up/down, home/end) when having focus on the index field. This is to allow you to look at messages in real-time, or messages received at certain points in time, even if you are receiving hundreds of them per second. 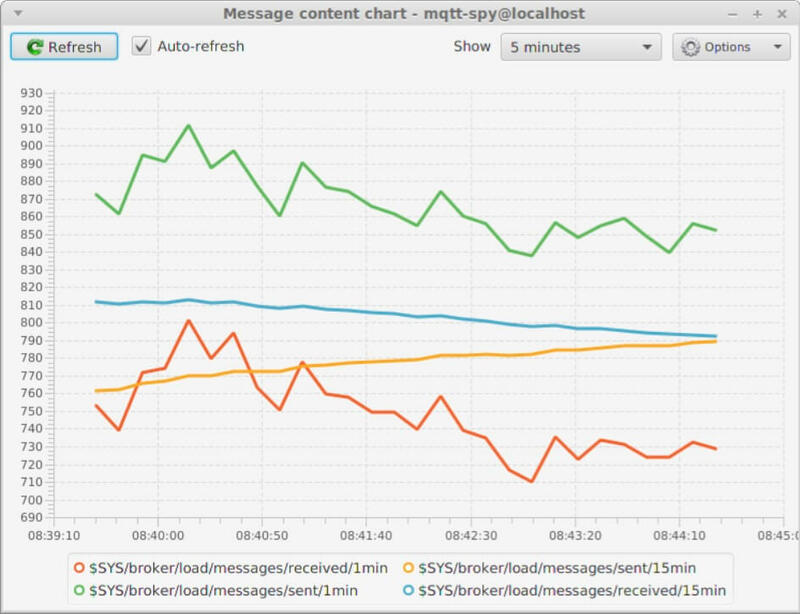 What is important to remember is that mqtt-spy keeps buffering the received messages so that you can inspect them at a later time. By default, this is the newest 5000 messages per subscription. This means that when you hit the limit, old messages are deleted, and newly arrived ones are added. The latest has always got the index of 1. Note: in the future, there will be an alternative to the “one message at a time” - it will be possible to display received messages as a list - in a similar way to how the search results are displayed. Apart from just browsing the received messages, you can also search for them. To do this, click on the Search button, create a new “search tab”, and put it the text you want to find in the payload. You can make the search case sensitive, and enable auto-search, so that when new messages arrive, they will be matched against your search criteria. Once happy with the search options, hit Enter or click the Search button - this will trigger search results being displayed. The 3rd blog post will cover the advanced search: with script files and inline search scripts. Apart from the message browser, each subscription tab also has a summary of the received topics and messages. This summary is effectively a list of all topics matching the defined subscription. Each entry in the table also shows you the last message received, total number of messages currently stored for that topic, and time of last message. The topic list also acts as a selection criteria to what messages to browse in the message browser pane. As an example let’s assume we are receiving messages on 3 topics that match a single subscription. If you are only interested in the first topic, you can deselect all other topics in the Browse column, and the message browser will then only show you the messages for the selected topic. If you are not sure about what’s the exact topic string, you can search for it in the provided text field – this acts as a filter for the table, but doesn’t change your browsed topics. The topic summary table also gives you access to more charts and browsing options via the context menu – right click on any of the topics to see all options. There are a few ways of customising the user interface to suit your needs or typical usage. First - there are perspectives. These are pre-configured sets of visible panes or level of detail. Second - each connection tab can be customised individually. Right click on the tab and select the View menu. This gives you access to all the options like switching between detailed and simplified views, making the message pane resizable, detaching the connection tab and hiding/showing the individual panes. Third - you can manually resize the split between the message pane and summary pane. You can also hide/detach panes – see the small “settings” button in the right hand side of the pane title. Worth a mention is that mqtt-spy will also automatically remember the size of the main application window, so the next time you run it - the size will be as you left it. 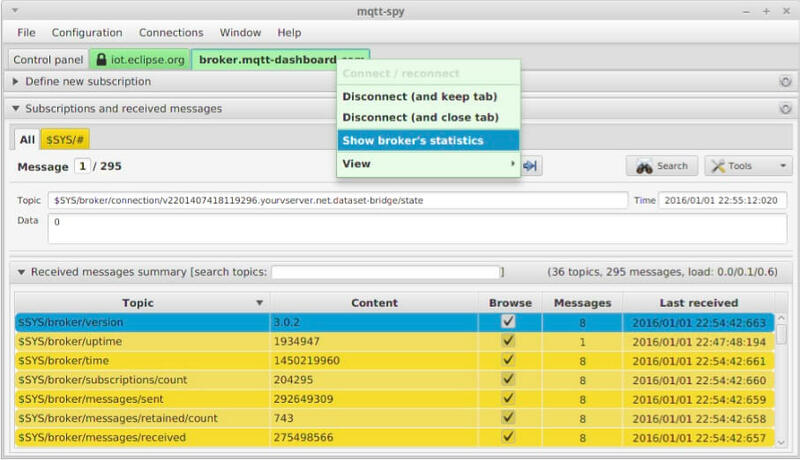 For all its MQTT connectivity, mqtt-spy uses the Eclipse Paho Java client – a rock-solid library allowing applications to connect to any MQTT-compliant broker. As of January 2016, mqtt-spy & mqtt-spy-daemon are also part of Eclipse Paho & Eclipse IoT. All contributions to the project are very welcome! Whether it is a bug report, a feature request, a bug fix, a feature implementation or just a suggestion – they are all very much appreciated. Get in touch via the GitHub page or Twitter. There is also a suggestion to donate to UNICEF from time to time if you like and use mqtt-spy on a regular basis. You can do it via http://www.justgiving.com/mqtt-spy or directly on UNICEF websites - any donations count, big or small! Next week the MQTT Toolbox will look at mqtt-spy-daemon, the headless (console/command line-based) version of mqtt-spy. You can subscribe below to get notified as soon as the next blog post is available. 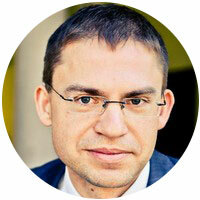 Kamil is a Technical Architect at Resonate. He’s been working with MQTT and other messaging technologies since 2009 as part of the IECC Scalable development programme - the leading railway signalling control system in the UK.